Please email your portfolio and artist statement for review. 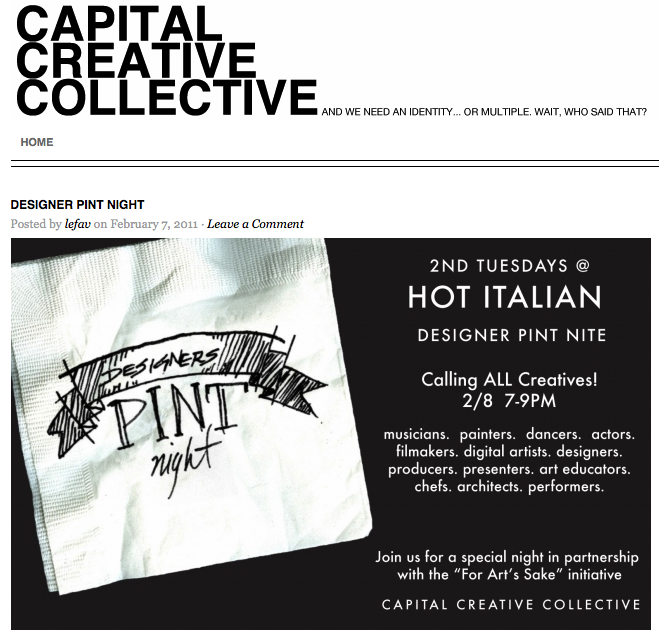 We will be meeting next door (studio B) at the Urban Academy of Sculpture and Art to check out the new studio workspace! Founded by Scout Handford and Molly Brown, May 26th 2010. 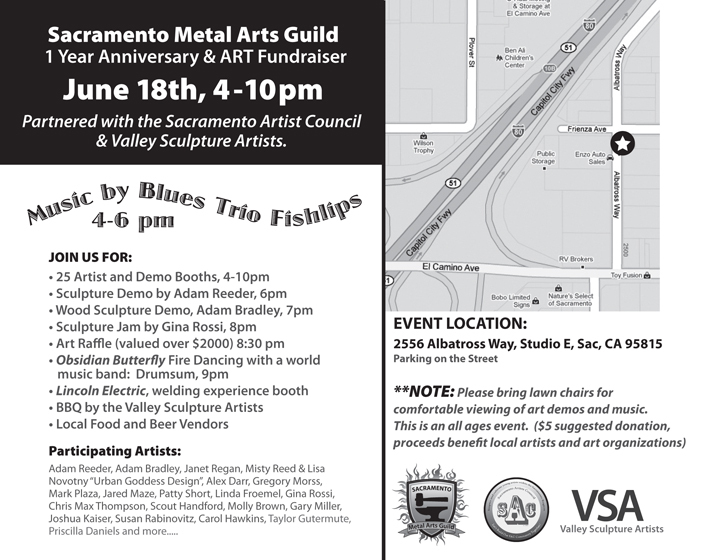 Partnered with the Sacramento Artist Council & Valley Sculpture Artists. 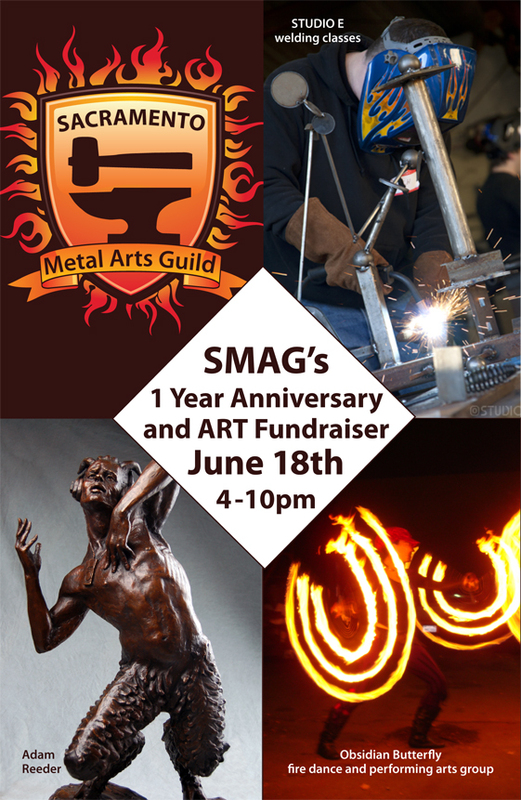 CALL TO ARTISTS: We have an Art Fundraiser coming up June 18th. Looking for artists to sell and demo their art. Booths are free! by 5:00 PM May 2, 2011 (late applications will not be considered). Eligibility: Open to professional artists in the western United States. Project: This is a project of the City of Fallon in cooperation with the Churchill Arts Council, which seeks to provide visual enhancement to the City’s traffic signal boxes. We seek to provide improvements to the aesthetics of the City of Fallon—transforming mundane infrastructural elements into appropriate public artworks that enhance and celebrate the local environment. The project will involve painting two-dimensional renderings on up to ten (10) traffic signal utility boxes at a fee of up to $1,000 per utility box. The artist(s) selected for this project will work closely with agencies of the City of Fallon and the Selection Committee to design and paint utility boxes in the City of Fallon. Goals of the project include: increasing public awareness of art all around us; broadening viewers’ perspectives of public spaces within the City; and fostering a sense of place in and around the Community. 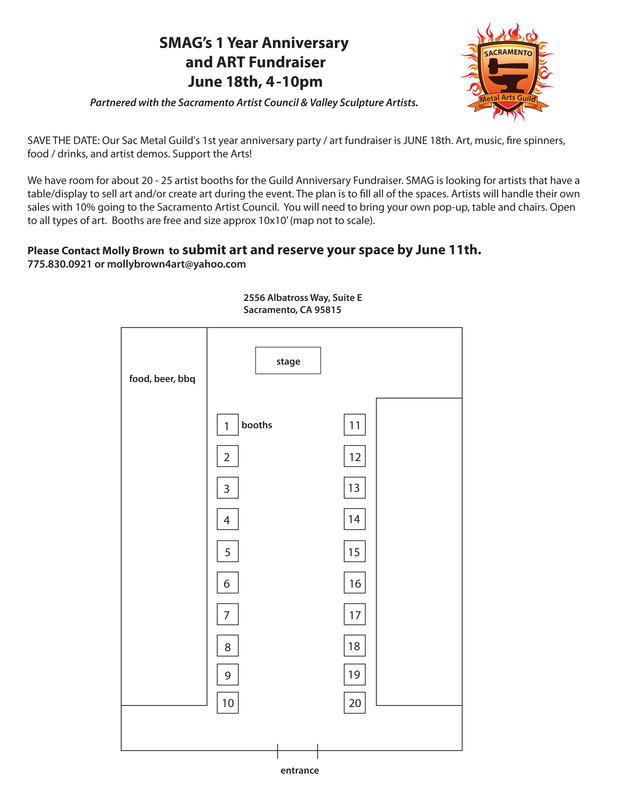 Criteria: Artists should have previous experience creating art for public places and will be required to work collaboratively with the Committee and agencies of the City of Fallon as noted above. Budget: The budget is up to $1,000 per traffic signal box which is inclusive of artist’s fees and all materials and supplies necessary for implementation of the proposal. •	Current resume detailing professional previous public art experience, artistic accomplishments and references, including awards if applicable. •	High resolution images on CD (min. 10, max. 20). Images must be numbered and labeled on an accompanying list. This should include title, media, size, date, location, description of work and, if appropriate, related budget information. •	Project Approach (including provisions for maintenance) should be limited to one page, typewritten, with artist’s name, phone and return address. •	An itemized budget including all fees, materials and supplies. •	Self-Addressed, stamped envelope with sufficient postage for the return of application materials. Selection Process: The artist selection committee shall consist Rachel Dahl, Councilwoman, City of Fallon; Valerie Serpa, Executive Director, Churchill Arts Council and Christine Fey, Arts & Culture Manger, City of Reno. Rights and Responsibilities: The City of Fallon reserves the right to decline any and all submissions or cancel this Request for Qualifications at any time. The completed artworks shall be owned by the City of Fallon. PlacerArts invites all emerging and established artists to participate in the 2011 Auburn Art Walk season. Art Walks are hosted at dozens of local businesses in Downtown and Old Town Auburn on the second Thursdays in April, June, August and October. 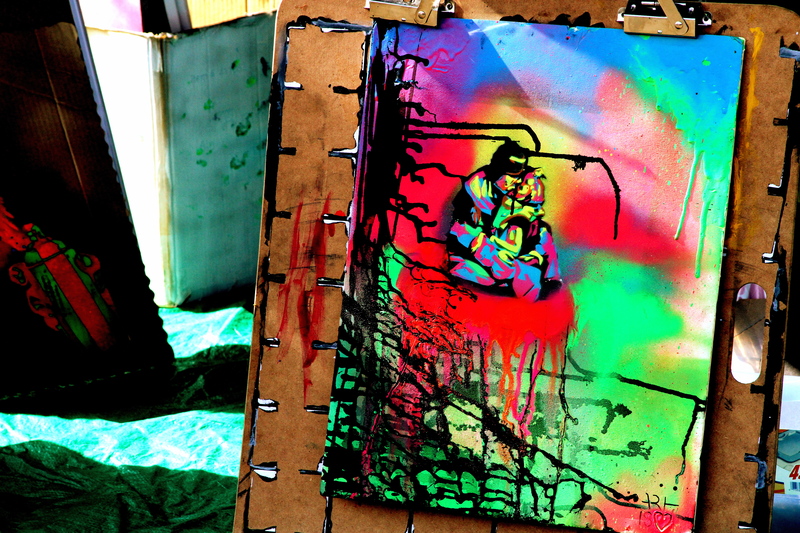 New artists are always welcome to participate in one or more Art Walks each season. The Auburn Art Walk Committee encourages all interested artists to attend an important Art Walk Orientation meeting at 6:30pm on Wednesday, February 2, 2011 at The Arts Building, located at 808 Lincoln Way in downtown Auburn. Artists who attend will learn about Art Walk guidelines for art and framing, how to submit a portfolio, timelines and tips for publicity and press releases. Information on the Auburn Art Walk and how to apply may be obtained at PlacerArts.org/artwalk. Please RSVP to PlacerArts by calling (530) 885-5670 or emailing office@placerarts.org if you plan to attend the orientation meeting.